Cacciatore is an interesting word. Chicken cacciatore refers to chicken prepared in a spicy tomato sauce with mushrooms and herbs. The Italian word literally means “hunter.” It refers to the ingredients that a hunter might have on hand when preparing the dish. 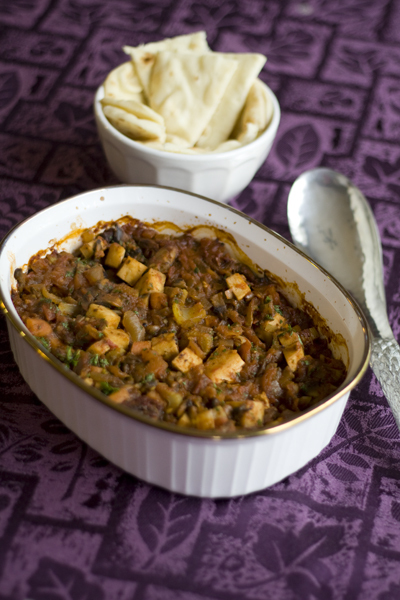 So, here is tofu cacciatore – hunter style. Just imagine yourself on in the middle of the prairies, lassoing some wild tofu. A call to simpler times. Serve this with our garlic mashed potatoes. 2. Heat a large skillet coated with 1 tablespoon of olive oil over medium high heat. Add the onion, carrots and bell peppers and cook, stirring frequently, for 10 minutes. 3. Add the garlic and saute for another 3-4 minutes. 4. Add the wine, basil, oregano, salt and pepper and cook, stirring frequently, for 3 minutes. 5. Add the tomatoes and tomato paste. Bring to a boil and allow to simmer for 15 minutes. 6. Heat another large skillet coated with 1 tablespoon olive oil over medium high heat. Add the tofu and saute for 8-10 minutes, or until lightly browned on both sides. 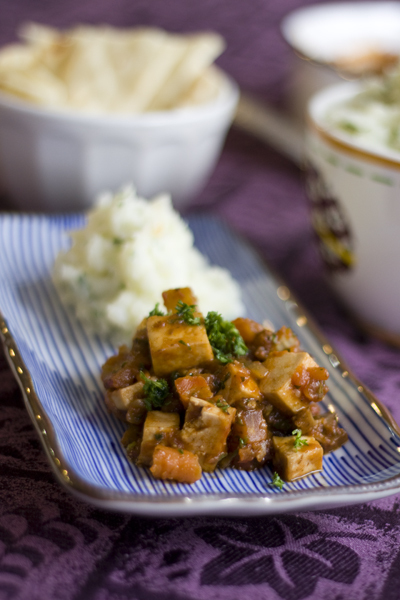 Place the browned tofu cubes in a 13” X 9” baking dish and cover with the prepared tomato sauce. 7. Bake for 1 hour. Garnish with fresh parsley. Serve over garlic mashed potatoes.